As an MK, Rusty Riddick was raised in Cameroon, West Africa. He quickly developed a love and passion for seeing African souls born into the kingdom of God. He wanted to see them saved. As a young man, he once darted out in the road to push a drunkard out of the way of oncoming traffic, because all he could think of was “that man is going to hell.” His burden grew stronger and after graduating, God confirmed a call upon his life to missions. His wife Adriane had received a call to Africa in a missionary service at the age of eighteen; she had never before stepped foot on foreign soil. They married and became AIMERS to Cameroon, and later were appointed as Intermediate Missionaries. Rusty worked with the evangelism team in crusades and was appointed as Director of Evangelism. He traveled and evangelized in crusades throughout Cameroon as well as Nigeria and assisted in the ground work of sending the first regional missionary from Africa, Peter Mua, to Equatorial Guinea. Adriane worked in the print shop, printing tracts and doctrinal material and taught in the bible school. Due to severe sickness and bad health they returned to the US for a season and after time God totally restored Rusty’s health. While at home, Rusty served as assistant pastor and youth pastor in Tioga, LA and later as assistant to the pastor and youth pastor in Marshall, TX. They later returned to Cameroon to minister during their National Conference and the call of God to West Africa became stronger than ever before. In 2010, they met the Foreign Missions Board at General Conference and were appointed as Intermediate Missionaries back to Cameroon. After returning to Cameroon, they felt a burden to plant a church in Douala, the economic capital, a populated city of over three million souls, in which there were no UPC churches. They began a work under a small tent and three months later God provided a building for worship. The church is maturing and growing and many souls have been filled with the Holy Ghost and baptized in Jesus’ name. Currently there is a Certificate Level bible school course ongoing in Douala. Besides pastoring in Douala, Rusty has overseen church building projects, is an active board member on the Cameroon National board and ministers throughout the country encouraging the ministry, preaching and teaching. Adriane teaches and works with children’s Sunday school, local ladies ministry, ministers in National Ladies conferences and helps in administration. The Riddick’s are blessed with three sons and a beautiful daughter in law. The oldest, Todd and his wife Sarah, serve as youth ministers in Mansfield, MO; Sarah also serves as music director. Ryan, age sixteen, assists in teaching children’s Sunday school and church building projects. He homeschools, studies French and loves African cuisine. Gentry the youngest, age six, loves to dress up like a cowboy or policeman, and enjoys “preaching” his favorite sermon, “David and Goliath”. 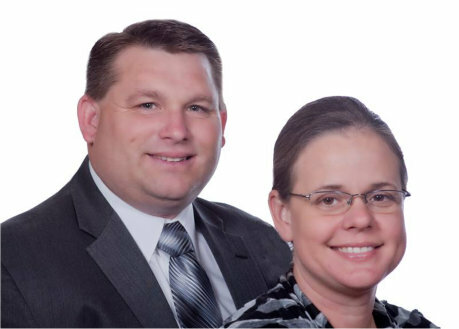 Rusty and Adriane have a love and passion to be a part of revival, soul winning, and spiritual growth in West Africa and are committed to Africa Forward!